With my legs feeling so good yesterday that it would have been a crime not to do NRR this morning. I did a longish turn on the front down the hwy with Giurg and Will, the conversation with Mark amused me. My words proved to be very true, I started off working back along the beach, but a combination of choppy wheels and the realisation I had an ITT tonight meant I slunk back into the bunch by Black Rock. Through Elwood the wind was destroying everyone silly enough to be on the front, eventually I found myself on what I thought was the right wheel for the sprint. A hard kick after a red light at Glen Huntly rd left me scrabbling. The guys in 2nd and 3rd wheel kicked early and I had to go around Tim McColl who wasn't looking up for the chase. Eventually one popped and the second must have figured that was the game won and stopped sprinting leaving me free to roll past in the last 10m. Ian said it well, "The 1/4 to bunch doesn't have any true sprinters", but that doesn't mean I don't like playing with them. In fact, I prefer not to have any true sprinters, because that way I have a chance to win. The ride in in the morning was lovely, the ride home was a little soggy. 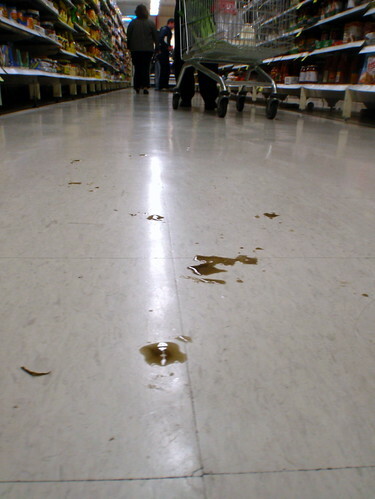 I kind of felt sorry for the little dude with a mop and bucket following me around Coles Prahran. He wasn't seeing the dirty puddles I was leaving as being anywhere near as funny as I was. This round was back towards the Burke Rd footbridge at the crit course, a few reccy laps showed the track was gripping well with only a couple of soggy spots causing any issue. As we waited to start a steady drizzle changed all that. By the time I set off there was barely a grippy bit of earth remaining anywhere. I was all over the shop, unclipping feet, taking terrible lines, over-braking, under-braking, I just felt like I was bleeding time everywhere. It seems everyone else bar Rohin had the same experience. Ro got through in 2:35 and I was next quickest at 2:45, sadly not enough to close the gap in the series to James Dickey, and after a top ride by Gavin it wasn't enough to wipe out the lead I gave him in the first round.